It was a last minute call to head downtown to the fireworks over the canal in Lockport. Well, I actually had planned to do it for awhile, but family plans went completely crazy and I wasn’t sure that we’d be able to make it. We did make it down there, and we were very impressed by the whole scene down at the locks. This week marked the 200th anniversary of the start of the Erie Canal. The State decided we should have a weeklong celebration across the breadth of the state, via the canal. Saturday night Lockport hosted the celebration. It was the perfect ending to a perfect week. When it came time to head downtown, only IdaLena wanted to go with me. I decided that we should walk down and enjoy the night. Plus, I figured that parking would be at a premium and the walk would do us good. Right about the time we were getting ready to leave, our friends dropped by to deliver one of our children back to us. I coerced them into driving us downtown. They ended up staying for the rest of the event. We were able to park at the YWCA, which surprised me. There were only one or two spaces left when we pulled in. 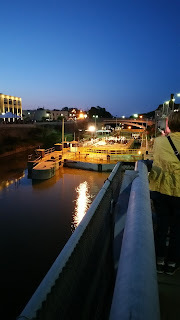 Getting out of the car at about 9pm, we could hear a woman singing from down in the locks. It echoed through downtown. The end of the Big Bridge was lined with people. As we got closer to the bridge, we could see that Canal Street and Pine Street were also lined with people. It was an amazing sight. The barge was down in the locks with the Albany Symphony aboard, performing. It truly was a perfect setting for the event. The escarpment walls glowed under the LED lights and the music had a natural amplification. Surrounded by adoring crowds, thirty feet above them, the musicians were able to hear their appreciation in the full round. 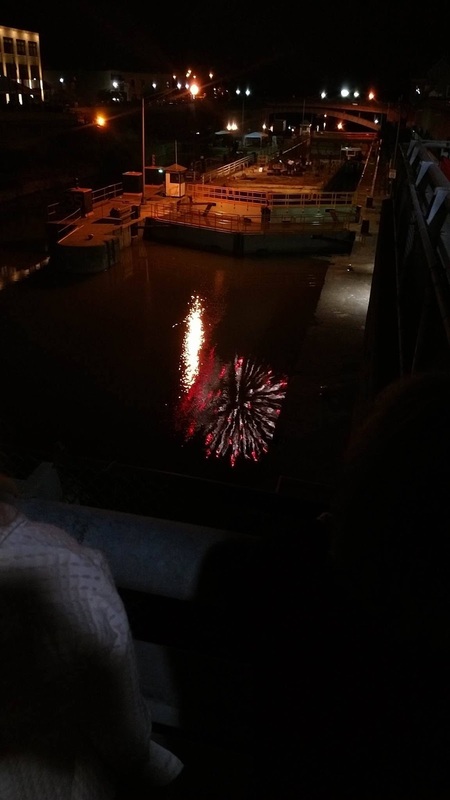 At the conclusion of the musical performance, the fireworks were set off over the canal. In my opinion, this site is far, far superior to the venue at Outwater Park. It was absolutely stunning to see each explosion reflected in the water and the windows of buildings downtown. The rolling echoes of the booms down the Deep Cut added to the effect. 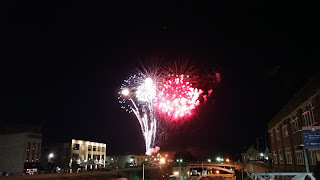 I think the City of Lockport should study the idea of moving the Independence Day Fireworks downtown. What a wonderful setting it could be. Imagine this: The city could close Main Street from Saxton Street to Pine Street for a street fair on the Fourth. There could be food vendors, or There could also be some live entertainment down in the locks area, much like the barge this past week. This could be an opportunity to showcase our downtown. Of course there would be some logistics to work out. First and foremost would be ensuring that the fire trucks could get to whatever emergency may arise. That may require staging a truck in another place for the evening, like at the County Courthouse. One person tried to indicate that parking would be an issue downtown. I do not believe that to be as much of an issue as indicated. Think of the congestion near the park when they have fireworks. There is mostly parallel parking on residential streets. In the downtown area, there are parking lots at the Big Bridge, by the Palace, behind the library, at the Courthouse, as well as other lots in the area. Additionally, there would also be on-street parking. Think what a boon it would be for downtown businesses. They would have an influx of people who may not normally visit downtown for shopping. Even if they were closed, someone may see a storefront and get the notion to revisit when it’s open. Having the Independence Day celebrations right in the heart of the city would make it truly a community event. This is all my opinion. I had an inspiration while experiencing the Erie Canal bicentennial event. It just seems to me that it would be perfect for Lockport. It’s something new and exciting. It’s just something to think about. There may be other considerations the city has to think about that we are unaware of. Still, I will offer my assistance if there is an interest. Craig Bacon loves fireworks. And he loves a good party. He also likes to think about what he can do to help his community rather than just complain without offering solutions.